Intercon Solid Oak Pedestal Dining Set Classic Oak INCOI4260SET. 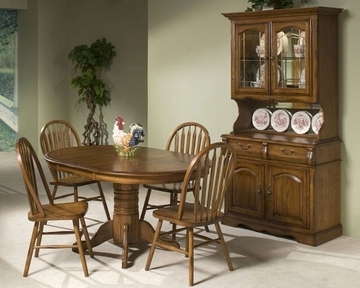 The Classic Oak Pedestal Dining Set From Intercon Is Made From Solid Oak And Finished In Burnished Rustic or Chestnut. 1 x Pedestal Dining Table Top IN-CO-TA-I4260-BRU-TOP. 1 x Pedestal Dining Table Base IN-CO-TA-I4260-BRU-BSE. 4 x Plain Arrow Back Side Chair IN-CO-CH-253SH-BRU-SU. 1 x Pedestal Dining Table Top IN-CO-TA-I4260-CNT-TOP. 1 x Pedestal Dining Table Base IN-CO-TA-I4260-CNT-BSE. 4 x Plain Arrow Back Side Chair IN-CO-CH-253SH-CNT-SU. 1 x Laminate Pedestal Dining Table Top IN-CO-TA-L4260-CNT-TOP. 1 x Laminate Pedestal Dining Table Base IN-CO-TA-L4260-CNT-BSE. Side Chair - 19"W x 17.5"D x 39"H.
Choice of Burnished Rustic or Chestnut finishes.